Get ready for fall with this simple, yet extremely delicious Overnight Apple Pie French Toast Bake. This is one of those breakfast recipes that you make and then wonder why you don’t make it more often, not only because it takes good, but because it is easy to make. And did we mention that it puts a smile on everyone’s face? 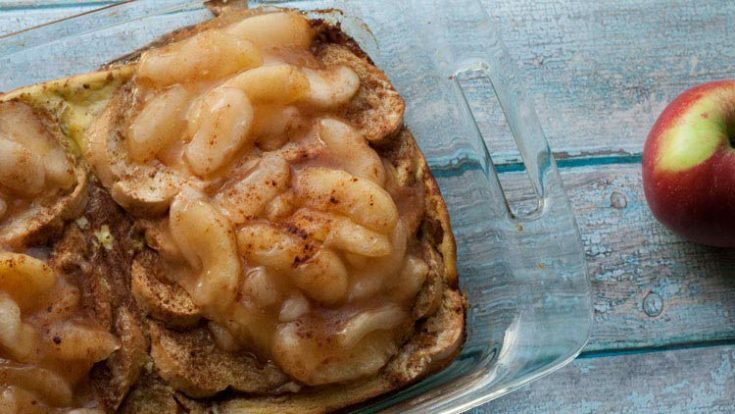 Because who doesn’t like to have a breakfast that is apple pie inspired? Um–hello! We said pie. We love easy breakfast recipes around here. Yes, typical mornings consist of a smoothie or even a bowl of cereal filled to the rim with sliced bananas and strawberries. BUT–when we make a home-COOKED breakfast…that’s all about making it easy. Like our overnight Southwestern Breakfast Casserole, Egg White Scramble, and even our Make Ahead Waffle Mix and Carrot Pancakes. These are all easy breakfast recipes that make us wonder why we don’t cook breakfast every day of the week. Now, you could totally make this from scratch if you’re so inclined. And we’re talking completely from scratch. Make the bread, can the apple pie filling–you know, the whole nine yards. We didn’t, but you totally could. Although, making apple pie filling is totally on our list this year–so we’ll be hitting some Wisconsin apple orchards for u-pick season and loading up on fresh, good-for-you apples. Yum! You’ll love this easy and scrumptious breakfast recipe and we’re pretty sure everyone you serve it to will love it also. And they’ll beg you for the recipe or want you to make it again and again. This recipe is so easy to switch up when you’d like to have a different flavor. Try it with cherry pie filling, pumpkin pie filling, or leave off the pie filling altogether and top it with fresh-picked berries. It’s so good! Lightly spray 13x9 baking casserole pan. Layer bread evenly in pan. Mix together eggs, sugar, cream and vanilla. Pour over bread. Refrigerate until morning. Top with apple pie filling, sprinkle with cinnamon and then put in oven that has not been preheated. Set oven temperature to 350 degrees and bake for 30 minutes.